I first spoke with James & Sarah just a few months before their wedding. As we chatted over the phone they mentioned that they really love photography. I was super excited to work with them! They tied the knot on a beautiful, sunny morning in Makena. When I arrived Della of Dellables was there setting up a vibrant flower circle for James and Sarah to stand in and say their vows. 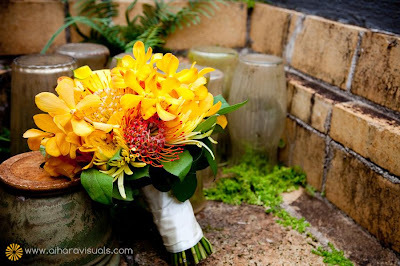 The bouquet, also made by Della, was simply gorgeous..bright yellows and oranges..my favorite colors! Lori Lawrence of Tropical Maui Weddings coordinated everything perfectly..the morning went as planned and a beautiful ceremony began. Reverend Laki blew the conch shell, the harpist strummed and the procession started. When I first saw Sarah I knew that she had an amazing sense of style…she was wearing the most adorable vintage gown with a Tiffany blue sash, Christian Louboutin sandals, a birdcage veil and had gorgeous sparkles encircling her neck and wrist. She was stunning. James smiled as his beautiful bride walked toward him and stepped in the flower circle beside him. They had a lovely ceremony with a few laughs and tears as their family stood around them and shared in their joy. You could see in James and Sarah’s eyes how much they adored each other. After the ceremony we started with a few portraits at Makena Cove then we went on a photo taking cruise around the island it was so much fun! We ended up in Kihei, Iao Valley & Old Wailuku Town. We met up a few days later at Ironwoods Beach in Kapalua for a Trash the Dress Session. I had such an amazing time working with these two! They were so much fun to photograph, naturals in front of the camera. I had so many images to share from the day that I decided to share them in slide show form. Thanks so much James & Sarah for allowing me to capture your memories. I felt honored to be a part of your day. Much thanks to Jana for all her help.